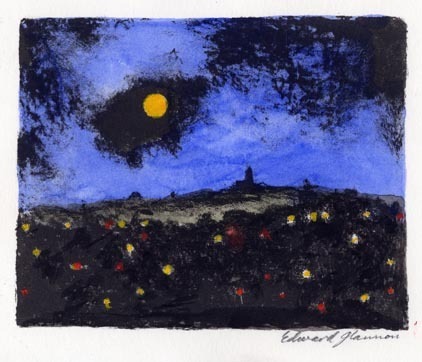 In honor of this morning’s “Blood Moon” total lunar eclipse (read about it here), we are sharing a print round-up of our favorite moon related prints. 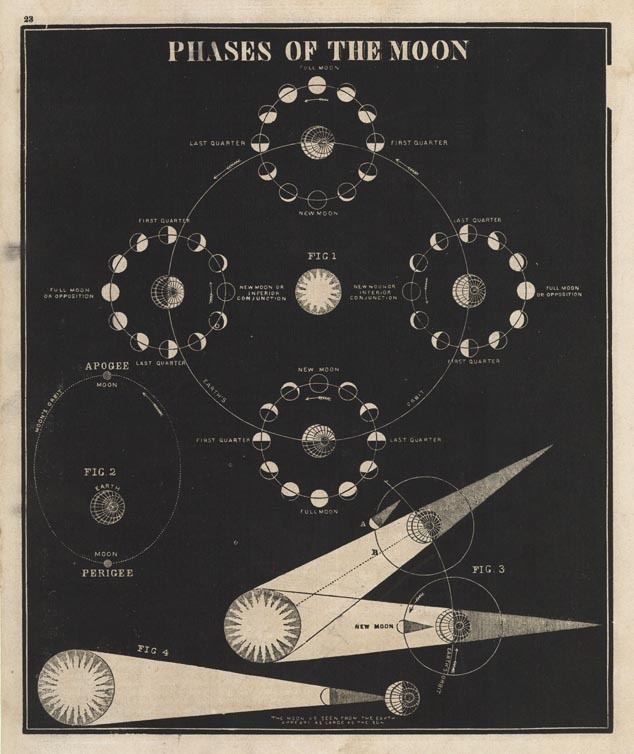 These lunar prints are stunning scientific and artistic representations, from multiple centuries. We hope you enjoy! 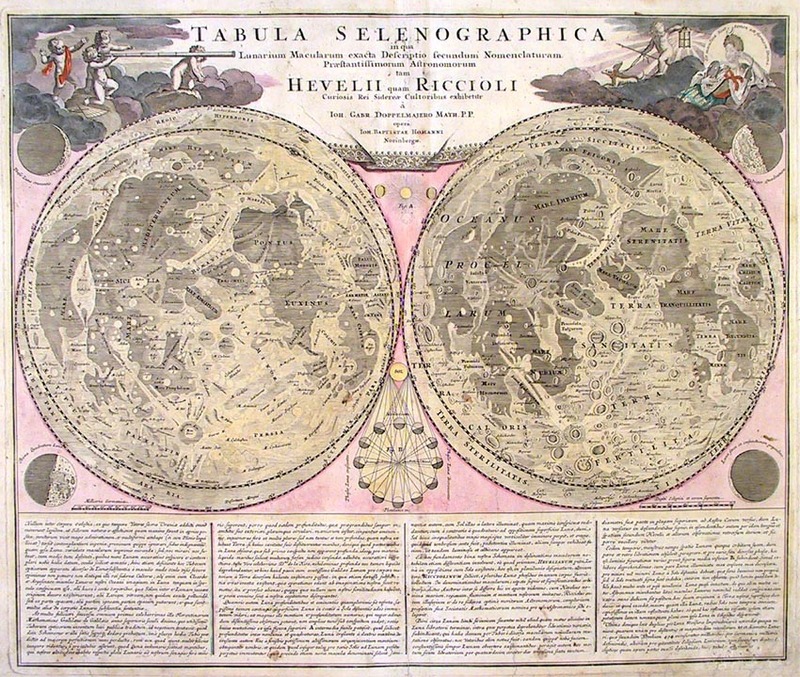 Tabula Selenographica in qua Lunarium Macularum exacta Descriptio… By Johann Gabriel Doppelmayr. Published by Homann Heirs, Nuremberg. Handcolored copper plate engraving, c.1742. LINK. This is an interesting and decorative map of the surface of the Moon. Doppelmayr was an astronomer as well as a professor of mathematics. He often worked with the Homann heirs. Together they produced a number of atlases, including Atlas Coelestis and Selenographica. Astronomy. Tab. II. Published by E. Chambers & Abraham Rees, London. Copper engraving, black and white, 1789. Platemark 14 3/8 x 8 1/4″ (365 x 210mm). LINK. 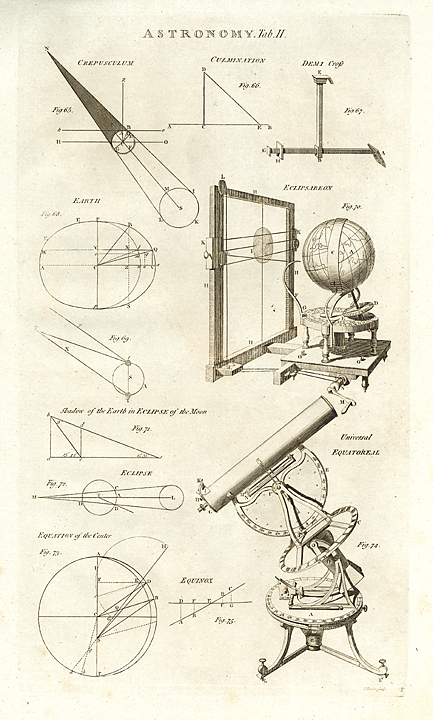 This print is from Chambers’ and Rees’ Cyclopaedia or, An Universal Dictionary of Arts and Sciences. The composite shows diagrams relating to eclipses. Phases Of The Moon. By Asa Smith. Published by Cady & Burgess, New York. Wood engraving,1848-1850. Image size 9 3/4 x 8 1/8″ (248 x 217mm). LINK. 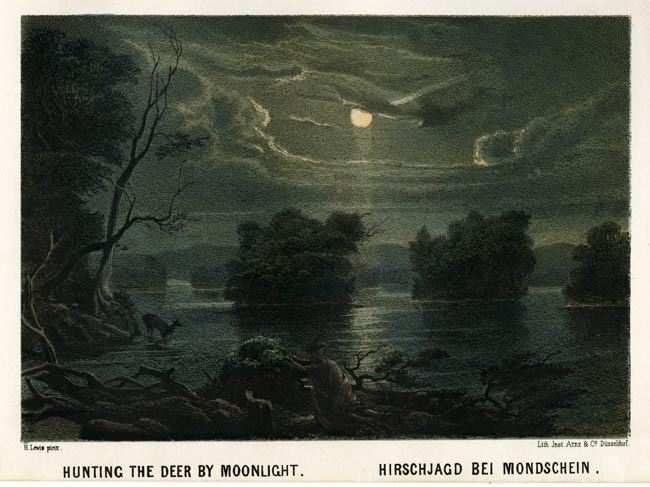 Hunting the Deer by Moonlight. By Henry Lewis. Lithographed by Jnst. Arnz & Co. Dusseldorf. Multi-stone lithograph, 1854-57. Image size Image 5 3/8 x 7 3/4″ plus title and margins. LINK. This print is from Das Illustrierte Mississippithal (The Valley of the Mississippi Illustrated). In the late 1840’s, Henry Lewis traveled the length of the Mississippi and, with the assistance of other artists, assembled a collection of sketches detailing scenery of the entire river. Based on these drawings, Lewis proceeded to paint a panorama on a continuous length of canvas which would be moved and viewed through a frame. In the fall of 1848, the completed piece (hundreds and hundreds of feet in length), began its tour of American cities. A European tour followed and while in Dusseldorf, in 1853, Lewis teamed up with the publisher Heinrich Arnz to redo the sketches as lithographs, illustrating a book on Mississippi scenery. While production was sporadic and relatively unprofitable, the resulting seventy-eight lithographs provide a early and remarkably complete record of the Mississippi River. The Full Moon. By John Taylor Arms. 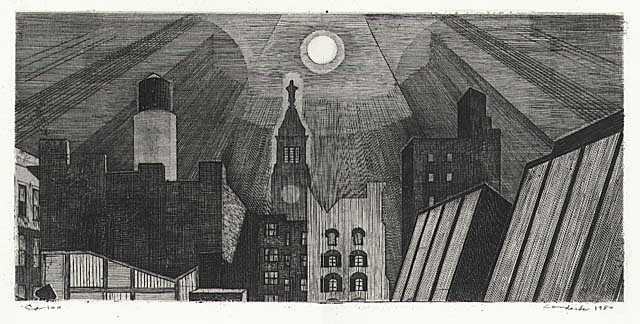 Etching, 1920. Image size 8 x 5 15/16″ (204 x 151 mm). LINK. 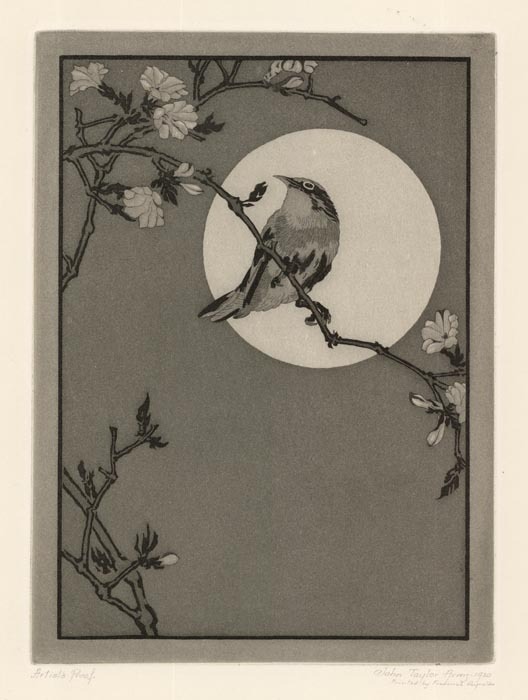 This etching by 20th century printmaker John Taylor Arms (1887-1953) is one of many in his oeuvre to include moons or moonlight. The print is an edition of 100 in color and 75 in black and white. This particular impression is an artist proof, and was printed by Frederick Reynolds. Reynolds was born in London, immigrating to New York in 1911 to establish himself as an artist in the United States. He was an etcher and mezzotint engraver, and operated his own printing studio in New York. In addition to his own works, Reynolds printed for other artists, including Arms. Moonlit Balcony. (Comp 292). By Werner Drewes. 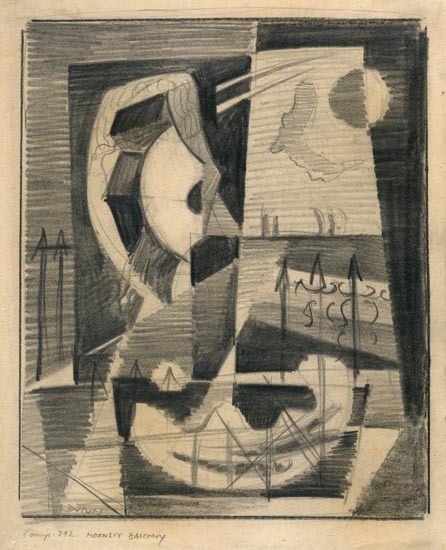 Graphite Drawing, 1938. Image Size 6 5/8 x 5 7/16″. Signed in pencil lower left, dated and inscribed with the artists cipher lower right “38”. LINK. Moon over Hilltown. By Edward Glannon. Lithograph, undated. Image size 4 1/4 x 5 3/8″. LINK. Manhattan Rooftops in Moonlight. By Armin Landeck. Copper engraving, 1980. Edition 75. Image size 5 13/16 x 12 3/16″. LINK. Moonrise Tide. By Jake Muirhead. Softground & aquatint, 2013. A/P. Image size 13 3/4 x 23 3/4″. LINK. 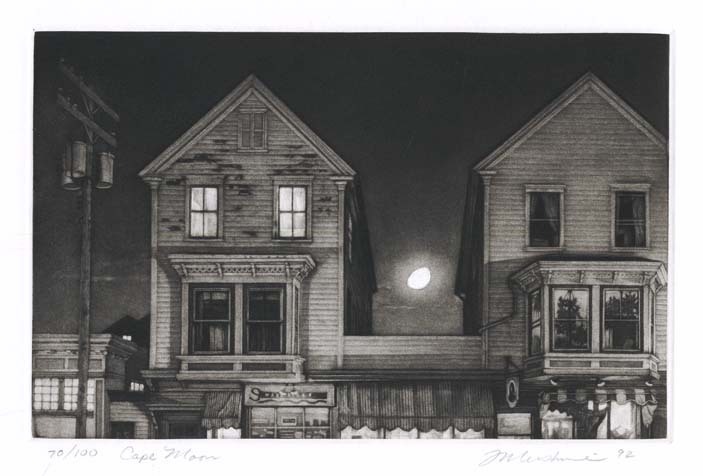 Cape Moon. By Frederick Mershimer. Mezzotint, 1992. Edition 100 + 10 A/P. Image size 5 5/8 x 8 13/16″. LINK. Full Moon. By Karen Whitman. 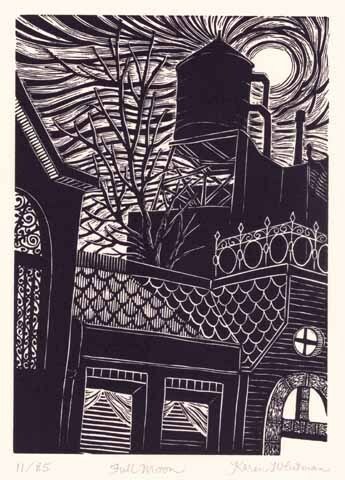 Linoleum cut, 2000. Edition 85. Image size 7 x 5″. LINK. Moon Garden I. By Grace Bentley-Scheck. Collagraph, 1997. Edition 40. Image size 6 13/16 x 11″ (176 x 279 mm). LINK. 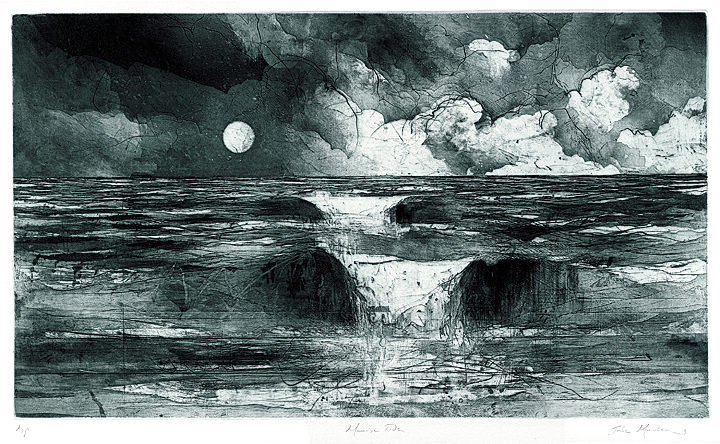 Above are a selection of moon-related prints and drawings from our 20th century and contemporary printmakers. While varying in style and technique, all depict the moon and it’s luminescence casting light and shadows throughout the foreground, making for some very interesting compositions. The Shadow of Brooklyn Bridge. By Emilio Sanchez. 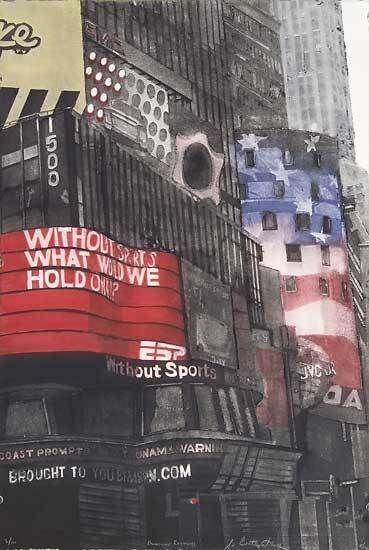 Color lithograph, 1988. Ed. 100. LINK. 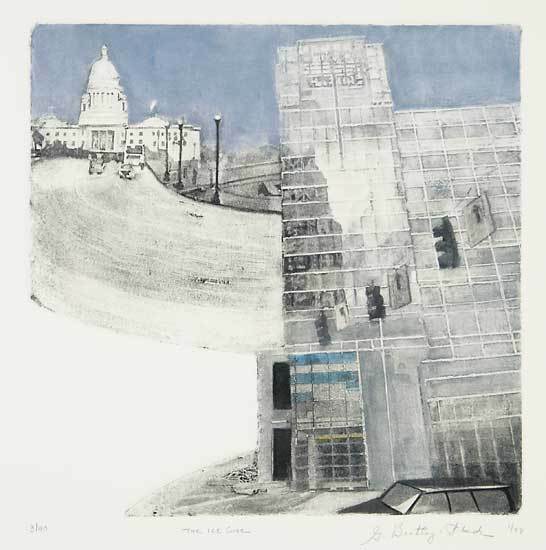 The Old Print Gallery is pleased to announce its summer 2014 show, Form, Light, Line: Architecture in Print. 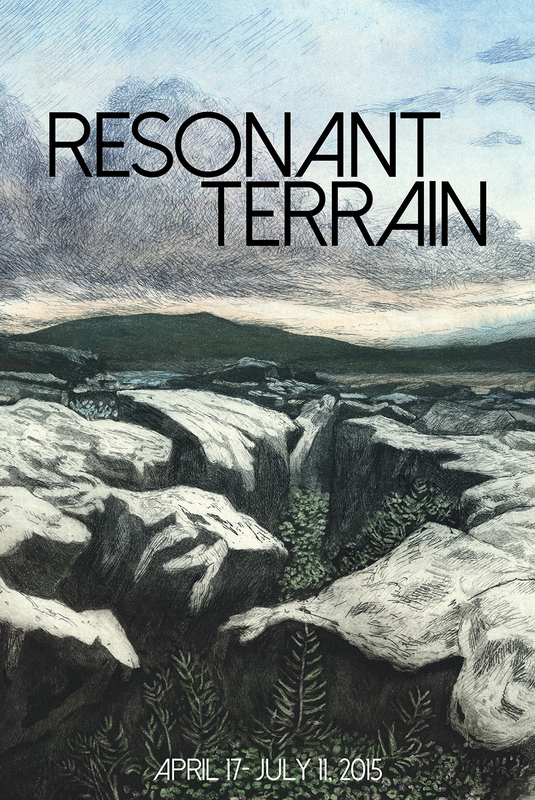 This group show of 19 printmakers spans over 90 years of creative expression, with prints by 20th century American masters John Taylor Arms, Martin Lewis, and Armin Landeck coupled with works by cutting-edge, contemporary printmakers. Form, Light, Line opens on Friday, June 20, with a nighttime reception at the gallery from 5-8pm. The show will remain on view until September 13, 2014. Artists have long found beauty in the strength, durability, and utility of architecture. 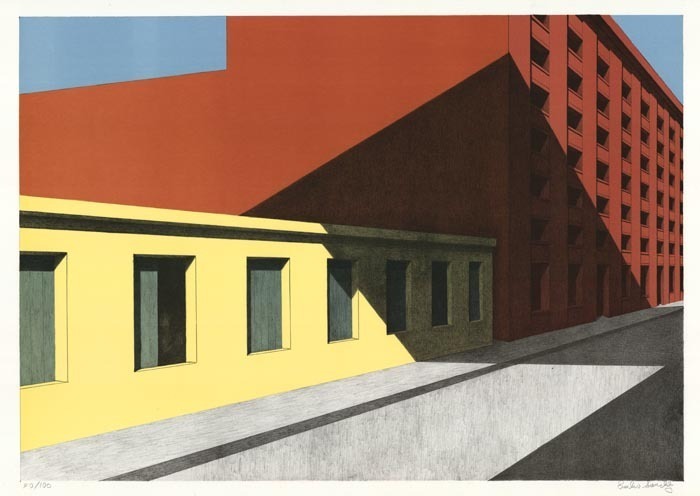 Form, Light, Line allows viewers to experience the familiar composition of buildings through the artist’s eye- to visually explore how surface captures light, how windows both reveal and reflect, and how dimensional spaces can be flattened and abstracted into planes of light and dark. From Left to Right: Urban Views #1. Urban Views #2B. Urban Views #4. By Patrick Anderson. Serigraphs, 2003. LINK. Highlights include a trio of black and white graphic serigraphs by Patrick J. Anderson, John Taylor Arms’ meticulous 1927 etching Lace in Stone, Rouen Cathedral, and a 1929 study for a large watercolor, Spiral Staircase, from the Martin Lewis estate. This pen and ink representation of the Queensboro Bridge is a delicate exploration of space and shading. Also on view is an Armin Landek 1941 engraving Rooftop, with accompanying annotated pen and pencil study for the print. The pair reveals the artist’s approach to perspective, as well as sketches of specific architectural elements, like moldings and chimneys. A Bronx Street Corner. By Martin Lewis. 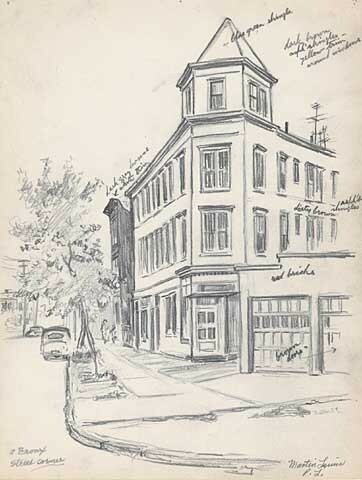 Pencil drawing, c.1946. LINK. Selected Artists: Linda Adato, Patrick J. Anderson, John Taylor Arms, William Behnken, Grace Bentley-Scheck, Joan Drew, Richard Haas, Su-Li Hung, Sidney Hurwitz, Armin Landeck, Martin Levine, Martin Lewis, Frederick Mershimer, John Ross, Emilio Sanchez, Art Werger, Steven Yamin, and Alex Zwarenstein. To see all the prints selected for Form, Light, Line: Architecture in Print, please visit our website. The Distant Past Resounds with Echoes. Grace Bentley-Scheck. 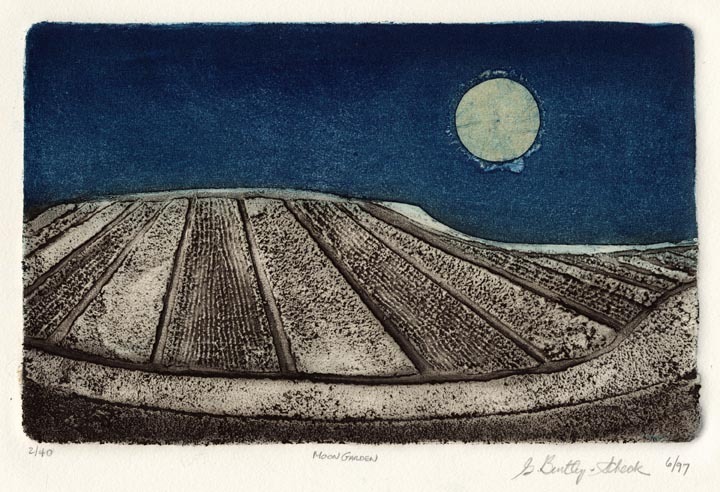 Collagraph, 2001. Edition 100. We would like to introduce our readers to OPG/OPS artist Grace Bentley-Scheck. 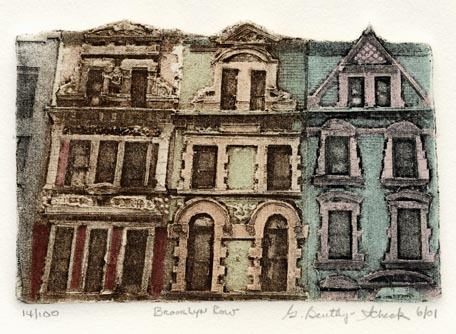 While we have featured her work several times before on the blog, we were particularly struck by her method of collagraphy, and how she utilizes the texture of her plates and matrices to bring depth to her prints. House of Blue Lights (Red). Grace Bentley-Scheck. Collagraph, 2006. Edition 100. SoHo Structure-Green. Grace Bentley-Scheck. Collagraph, 2004. Edition 100. Grace Bentley-Scheck was born in Troy, New York and currently lives in Narragansett, Rhode Island. She received her BFA and MFA from State University of New York at Alfred University, completing her MFA in 1960. 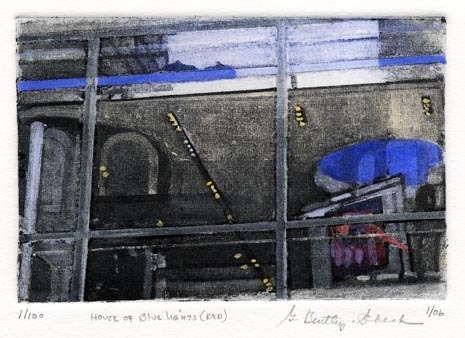 Her preferred medium is the collagraph- a process in which materials are applied to a rigid surface (usually paper board or wood), inked, and printed with the use of a printer’s press. Materials used to create the plate can be anything from smaller etching plates, acrylic, sand paper, bubble wrap, string, and even cloth. 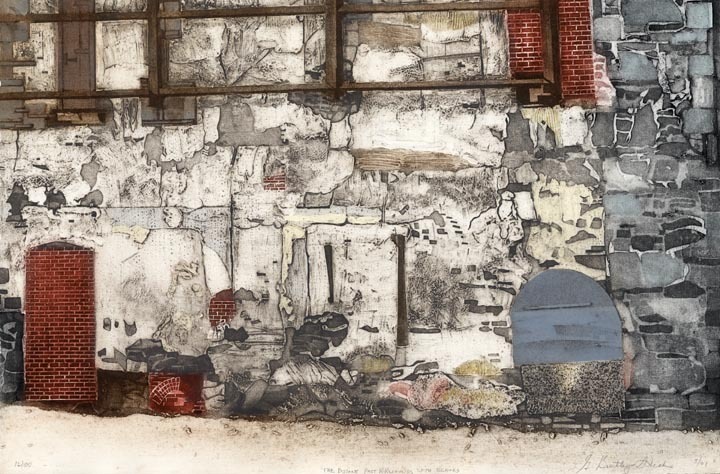 The process is described in detail in the John Ross and Clare Romano book The Complete Collagraph, which was published in 1980. 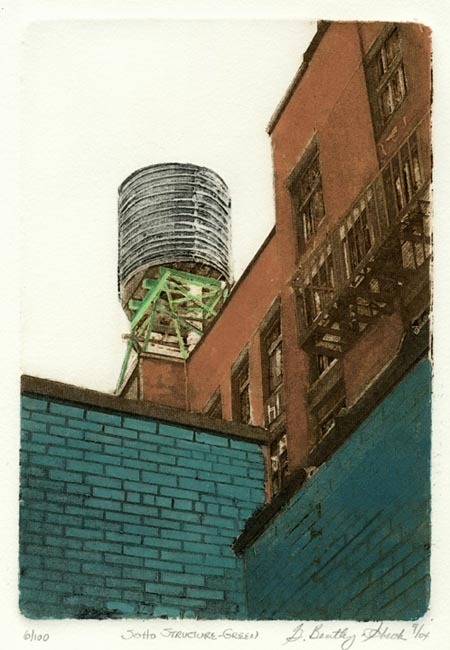 Grace is a member of SAGA (Society of American Graphic Artists), the Wickford Art Association where she serves as the scholarship chair, and Florida Printmakers. Her art and work was covered in an article in American Artist Magazine in August of 1999. The Ice Cube. Grace Bentley-Scheck. Collagraph, 2008. Edition 100. 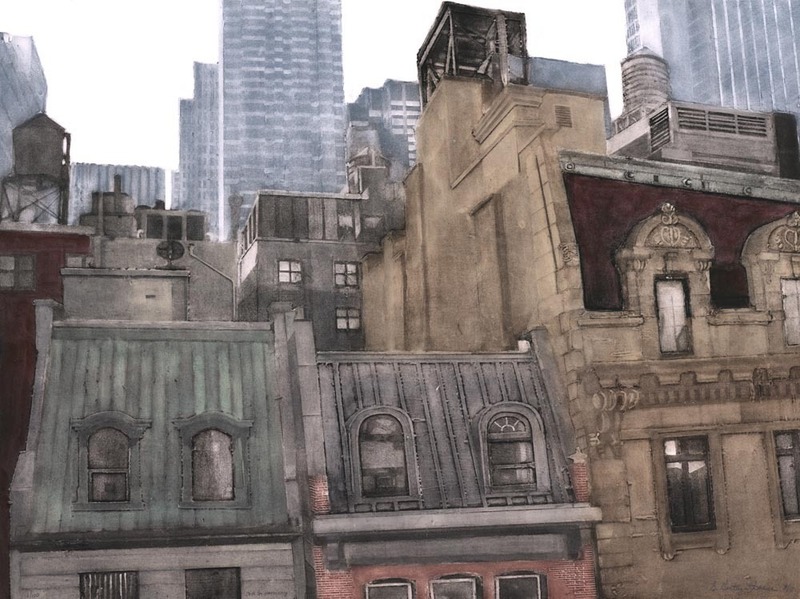 The philosopher, Gaston Bachelard, said that buildings reverberate through time. For many years, my works have dealt with architecture as space humans enclose which becomes dynamic via its passage through time. The process of building a collagraph plate layer by layer, much as time and exposure to the elements have created the subject, and the marks that result from the printing process provide an evocative medium through which structural changes, layers of painted advertising of graffiti, weathered surfaces, slight shifts in color, or play of light and shadow become visual symbols expressive of an intersection of time and space. 56th Street Harmony. Grace Bentley-Scheck. Collagraph, 2011. Edition 100. Brooklyn Row. Grace Bentley-Scheck. Collagraph, 2001. Edition 100. Broadway Rhythms. Grace Bentley-Scheck. Collagraph, 2006. Edition 100.